It was a “disappointing” end to what promised to be a cracker of a game between regular rivals Harbour View and Tivoli Gardens at the Compound on Wednesday night. But there were indeed fireworks of another kind. Following a 22-minute hold-up after bottles and other missiles were hurled onto the pitch in the 68th minute by angry Tivoli Gardens supporters, game officials called off the hot-tempered Red Stripe Premier League third-round match with Harbour View leading 2-0. Travelling fans directed their wrath — in threatening words and deeds — to referee Okeito Nicholson, starting in the 22nd minute when he gave Tivoli Captain Romaine Brakenridge his marching orders with quick-fire yellow cards for his animated and excessive dissent after his teammate Howard Morris was cautioned. Fourteen minutes later, the team’s most decorated player, former national player Jermaine “Teddy” Johnson, was shown a straight for an overzealous tackle on Harbour View left back Ryan Wellington. From then on referee Nicholson was a marked man. Before the final disruption in the second half, the game was held up for two minutes immediately after Breakenridge was sent off as Tivoli supporters expressed their disagreement by launching a few empty glass bottles in the direction of the under-fire referee. But play resumed as nine-man Tivoli bravely faced their odds until all hell broke loose in the 68th minute, when the missile attack was more intense and threatening. The referee and the Harbour View bench were the clear targets for in the incoming projectiles, which came in trickles rather than a heavy downpour, but threatening nonetheless. Both coaches — Harbour View’s Ricardo “Bibi” Gardner and Tivoli’s Omar Edwards — were clearly deflated by the unforeseen outcome. “I think it was disappointing as people came out to see a game of football and the players also came out to play an entire game of football: and that’s what they do on day-to-day basis and it was sad not to be able to play 90 minutes,” said the France 1998 World Cup star. Harbour View, who entered the contest in eighth position on 30 points and desperate for points after a wretched run of consecutive losses, were gleefully on their way to quench their thirst. “I thought we were in control from the get-go and we maintained that control throughout… and then Tivoli went down to nine players and we continued to have control. But clearly there are bits that we need to work on in training in order for us to improve individually and collectively.” said Gardner. Tivoli’s Edwards, too, felt let down by the unfortunate circumstances that contributed to the premature end to the contest. “I must say I am very disappointed as we wanted to finish the game. And although the two red cards affected us, we were still playing as we changed our plan by playing behind the ball and trying to hit them on the counter-attack. “At half-time, we tried to get the players back into the mindset to play as we told them that ‘we are not out of it yet’. “I really thought the referee was tough on us, and even after the red cards the calls continued to go against us until the game was called off,” noted Edwards. 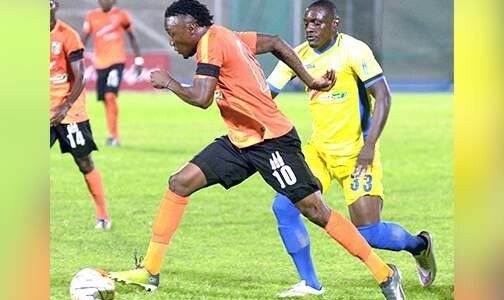 Tivoli entered the contentious fixture in fourth spot on 37 points and could be facing sanctions after match commissary Martin Lyn and referee Nicholson would have submitted their reports to the Premier League Clubs Association for its judicial arm to make a ruling. And when the teams were able to put the ball on the ground and play, Harbour View took advantage of their one-man advantage at this stage when Captain Nicholas Beckett ghosted in at the back post to head home Evan Taylor’s teasing left-sided corner in minute 34. Now down to nine players, the ‘Stars of the East’ got their second goal in the 55th minute when former Tivoli striker Rafiek Thomas headed into an empty goal from Deshane Beckford’s ricocheted shot off the upright. Harbour View — Christian Kluvi, Nicholas Beckett, Christopher Harvey, Ryan Wellington, Kereem Manning, Fabian Grant, Evan Taylor, Andrew Allen, Peter-Lee Vassell (Tyreek Magee 63rd), Deshane Beckford, Rafiek Thomas. Tivoli Gardens — Nicholas Clarke, Kenroy Lumthen, Romaine Brakenridge, Barrington Pryce, Shavar Campbell, Marvin Stewart, Tevin Shaw, Howard Morris, Ajuma Johnson (Elton Thompson 45th), Jermaine Johnson, Colorado Murray (Andre Moulton 65th).